How Can Playing Disney Infinity Help Support a Great Cause? When you read the title to this post, you may have really asked yourself, "well, how can playing Disney Infinity help support a great cause?" Thanks to Will Kelley from Inside Disney Infinity, we have an answer to that question. Inside Disney Infinity is a site dedicated to the video game Disney Infinity. This is also the home of the Inside Infinity Podcast, a weekly podcast where Will and other members of the community, discuss news, rumors, and info related to the game. He is passionate about video games and anything Disney related. The marriage of the two is his inspiration for the site, and the podcast. When we heard that Will and the Inside Disney Infinity community was banding together to help support the Children's Miracle Network by playing video games for 25 hours straight, we asked Will if he would write up a quick guest post to explain this in more detail and fill our readers in on how they can help out as well...as well as how you can win some amazing, extremely exclusive prizes. Watch the Inside Infinity trailer below and read on for more details. "First off, I would like to thank the folks at Pixar Post for giving me this opportunity. Secondly, I would like to thank you for taking the time to read this post. My name is Will Kelley and I run a Disney Infinity Podcast. You may be asking yourself "why is Will here on Pixar Post, talking to us about a video game?" Well the answer is simple -- Kids. You see, every year the Children's Miracle Network puts on a marathon to help kids and Children's Hospitals across the world. Extra Life is a 25-hour video game marathon, where people from all over the world play video games in support of a Children's Hospital of their choosing. This year we have put together a team and we will be playing Disney Infinity for 25 continuous hours. We thought “what better way to support kids, than by being one ourselves?" Each of us has chosen our local Children's Miracle Network Hospital where thousands of children are treated each year, regardless of their family's ability to pay. These kids are facing scary stuff like cancer, cystic fibrosis, and injuries from accidents, to name just a few. On November 2nd, 2013, we'll be a part of a huge international celebration of the social impact of gamers with Extra Life, and it's our sincere hope that you'll find it in your heart to support us. We have garnered support from members of Disney Interactive and Avalanche, the ones responsible for Disney Infinity. During the marathon we will be live streaming the entire event. We will be giving away exclusive items to those that can participate, and what is even more exciting, we are lucky to have a few developers from Avalanche joining us. We will be hosting Fan/Developer play sessions, so that fans can meet and play with those responsible for their favorite game. It is my sincere hope that you can take the time to participate or donate. If you are interested, please take a moment to visit our Extra Life page at www.insidedisneyinfinity.com/ExtraLife Your donation is tax deductible and is for a great cause. We can't do this alone and need all the help we can get. Thank you." One of a kind, Concept Art with the artist signature. A Developer Disc, which includes the upcoming release of Ralph (from Wreck it Ralph) - this is your chance to play with Ralph before he is released. This disc will be signed by the two Character Leads for Disney Infinity. One of a kind, Starter Kit. 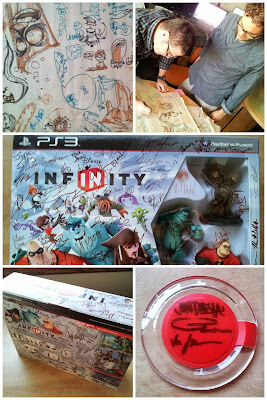 This starter kit is signed by every member of Avalanche, it even has John Vignocchi's signature (The executive producer of Disney Infinity). We've supported the Inside Disney Infinity crew with a donation, have you? To donate, just head to www.insidedisneyinfinity.com/ExtraLife and scroll to the bottom of the page - you can choose to support the Inside Disney Infinity team as a whole or select one of the individual players who will be playing in the 25-hour marathon! When you donate please enter "Pixarpost.com" in the Referral Code box so the Inside Infinity team can know how much Pixar Post readers support this great cause! Thanks again to Will for coordinating this event and for the entire Inside Disney Infinity community. Let's help them reach their goal! Pixar Post: How Can Playing Disney Infinity Help Support a Great Cause?